ForwardLine was founded by a team of entrepreneurs and finance professionals committed to providing small business owners with an alternative financing solution. The company uses technology and non-traditional credit algorithms to finance 98% of U.S. businesses that banks consider too small and too risky for a business loan. Find out how this innovative financial services company tripled business volume by using Salesforce Community Cloud to fund Main Street more quickly. 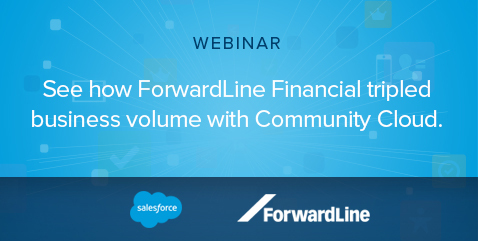 You’ll learn how ForwardLine built a customized online loan application and synced it with Sales Cloud — with no coding required.